California avocados are the best in the world. So says downtown restaurant manager Daniel Avalos in a Valley Public Radio story by reporter Ezra David Romero. The fact that they currently thrive only on a small swath of coastal Southern California is being challenged by UC Cooperative Extension specialist Mary Lu Arpaia. She is on a mission to find avocado varieties that withstand the hot summers and cold winters of the San Joaquin Valley, where irrigation water and crop land are more abundant and cheaper. She hopes to find avocado varieties that ripen at various times of year, and varieties that might be an alternative crop for citrus growers should huanglongbing, a disease that has devastated the Florida citrus crop, take hold in Central California. "There's a void of California fruit on the market in the months of November, December and actually early January," Arpaia said. "So if we can find different selections that maybe are unique that fit into that window, then we help the entire California avocado industry." An as-yet unnamed avocado variety. Romero visited the UC Lindcove Research and Extension Center to see the trees in Arpaia's study. 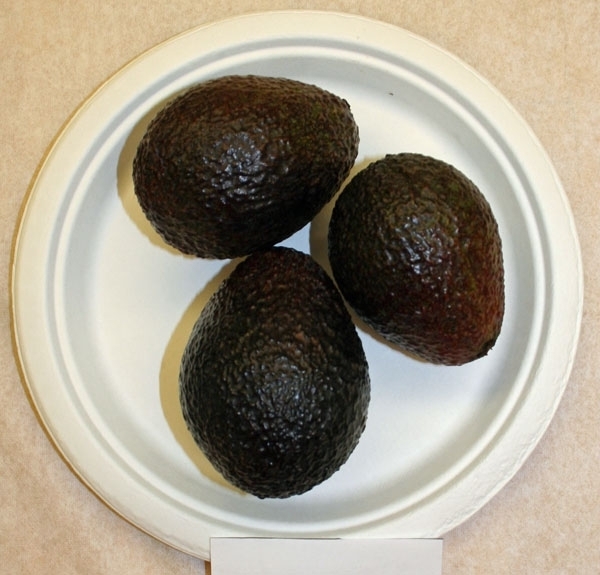 Currently, the vast majority of California avocados are the Hass variety. The goal is to breed varieties with similar eating quality that grow to a moderate height and have high yield. One potential that is already being produced by nurseries is called "gem." "This is gem," said Eric Focht, a staff research associate in Arpaia's lab. "You can see it's a little more oval or egg shaped than Hass. It has the speckling on the skin. Now as this ripens, it will turn dark and a lot of times the speckled lenticels with get a yellow kind of golden color it it." Another promising variety is called "lunchbox" because of its small size. According to Focht, it "just falls out of the skin." Arpaia said, "It makes wonderful guacamole and I found, with a non-replicated test in my refrigerator, the fruit doesn't brown." Arpaia's favorite guacamole recipe is featured at the end of the story on the KVPR website.